Put that stack of old magazines to use! 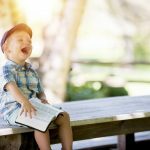 Make a list of 15-20 common things (like a tree, an apple, a child, etc) and have your child search for these pictures in the magazines. Once he or she find the picture, have them cut it out of the magazine and paste it next to the words on the list. (For younger children who do not yet read, make your list in pictures!) Once they've found all the pictures, they've completed the scavenger hunt and are declared the winner! The prize could be some screen time or even a lollipop to soothe that sore throat! Looking for an organic lollipop for rewards that are all natural and packed with Vitamin C? Check out our favorite by YumEarth. Kids love to have their own space, so round up some blankets (ones that you can wash easily should they get germy!) and cushions and make a fort for relaxing. 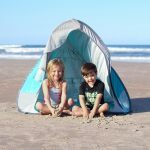 Or, dig out your camping tent and set it up somewhere indoors. Then, set your child up with a stack of books or, if they haven't had too much screen time, the tablet (we love the 7" Kindle Fire for our kiddos), and let them play! 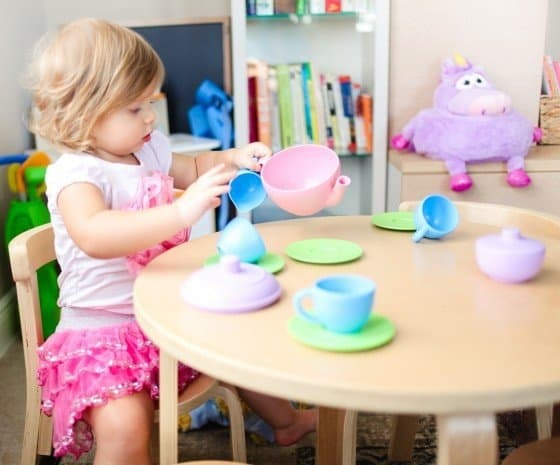 A great way to get your child to drink liquids is to have a tea party! If you have a daughter and have a tea set, use that! If not, just gather the cutest mugs you can find. If you're brave, or if your kids are older, you can even use the good china. Make tea with honey, or any other beverage your child loves and serve with a granola bar or some fruit for a little treat. We love this eco-friendly wooden tea set from Plan Toys, because it's beautiful, functional, and has lots of fun accessories. Kids of all ages love to play with blocks. 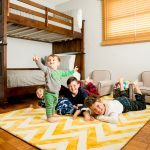 These magnetic blogs by Tegu are a twist on classic blocks. These beautiful and colorful blocks are made of eco-friendly, non-toxic materials and have a magnet imbedded inside. When you put two together, they attach to each other with a satisfying little click! 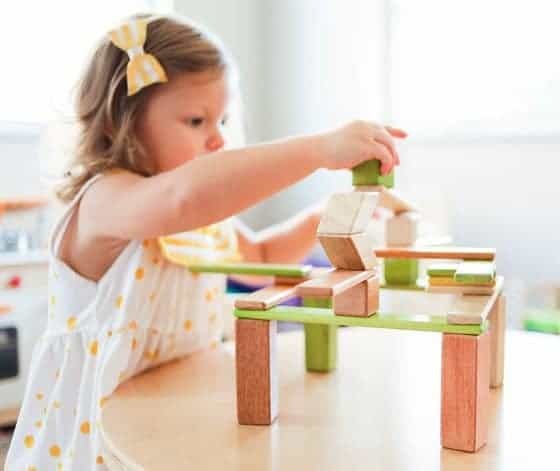 The possibilities are endless and Tegu magnetic blocks will keep your under-the-weather cutie busy for hours! 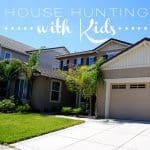 You can always set your kids up with some paint or markers and crayons. But, this "art & craft" activity is super cool and likely something your children haven't done before! For this you'll need wax paper, Sharpie Markers, a ruler and scissors. If you have a small window next to your front door, cut out a piece of wax paper the size of that window. If not, just cut a square of wax paper in a suitable size to hang in any of your windows. Set your child up at the table and cover the table with an inexpensive tablecloth or some newspaper. (Remember, Sharpies are permanent!) Then, let your child draw a design on the wax paper and color it in with the markers. A design with some detail -- but not too much...think flowers or rainbows -- works best. If your child is old enough, have them use the black Sharpie to first outline a design and then color it in. (It'll look more like stained glass this way.) Or, your child can trace a picture using a black Sharpie and color it in after it's fully traced. (For younger kids, trace it for them and let them color it in.) Then, when your child is done, hang it in the window and you've got a beautiful "stained glass" window! If a particular holiday is coming up, have your child completely color a small square. Then cut it into a shape and hang in the window! Or, make a bunch of triangles, string them together with twine (like this Hemp Cord) and make a stained glass banner for a festive look no matter what season! This is a game your child will need you (and siblings or dad, if they're around) to do, but it's fun--and funny! One person starts by saying, "Once upon a time...". Then it's the next person's turn, and he or she adds something to the story, leaving an opening for the next person to pick up the story. For example, the first person says, "Once upon a time" and the next person says, "there was a princess who lived in a..." and the next person would add where she lived and another detail before passing it on. Continue on until each person has had a few turns. It's usually a pretty hilarious experience! If your child is old enough to read and write, you can also spin a story on paper. For this game, start with "Once upon a time," written on the top of a piece of paper. Have the next person add their line--"there was a princess who lived in a..." and then fold over the top of the paper so only one line is showing; that way the next person would only see "there was a princess who lived in a...". Continue by having each person add a line and then folding the paper over so that only their line is showing for the next person. Not being able to see what's above makes the end result even funnier! Once everyone has had a few turns, have someone finish the story. Then, read it out loud and prepare to laugh! These three games are pretty self-explanatory, but we included them here because they're easy, and you can play with your child while you're prepping dinner, doing the dishes, or paying the bills. Sit your child close to where you need to do things and start the games! For "I Spy": One person chooses an object that is visible to all the people and says, "I spy with my little eye something beginning with ...", naming the letter the chosen object starts with. For example: "I spy with my little eye something beginning with C" if the chosen object is a car. Other players have to guess the chosen object. For younger kids, have them give the color rather than the initial letter ("I spy with my little eye something that is red.") For 20 Questions: One person thinks of an object and the others have 20 chances to guess what it is. For "Name that Tune": One person hums a song and the others have to guess what it is. 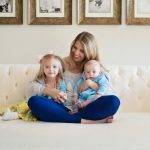 With older children you can make it more difficult by choosing a theme, like songs that are currently on the radio or Disney songs, etc. It's no secret that play dough can be messy, but kids love it. 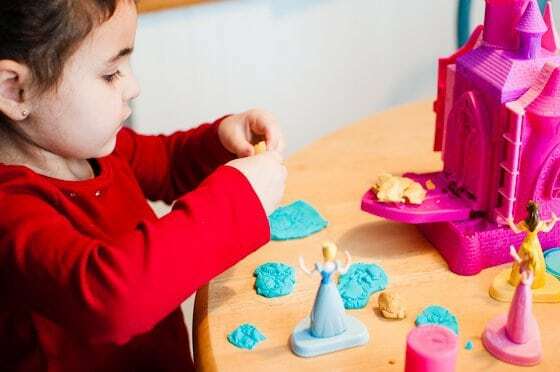 So, take a few minutes to set up and then let your child have fun with play dough. Put a tablecloth on the table, or cover it with newspaper or paper bags so that the play dough doesn't get stuck to your table. Cut up a garbage bag and put it underneath your child's chair, for easy floor clean up. We especially love Eco Kids Natural Modeling Dough because it's made from natural ingredients but still feels just like regular play dough. For this activity you'll need a bag of marshmallows (there are even vegan marshmallows available!) and some toothpicks. Add in raisins, too, if you have them! 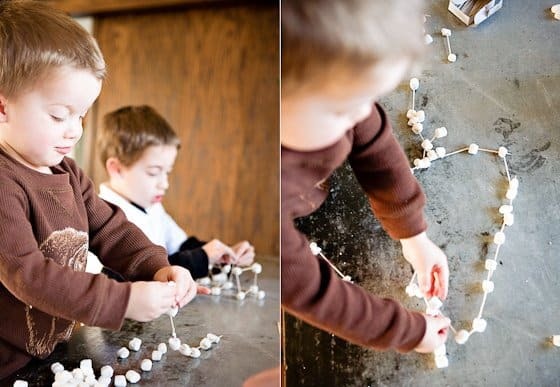 Simply give your children the bag of marshmallows and the toothpicks and demonstrate how they can make structures by sticking the toothpicks into the marshmallows and raisins. Challenge them by asking them to build a house, a tower, a letter or any other structure you can think of. Be sure to supervise younger kids as they use the toothpicks--or, give younger children pretzel sticks to work with! Give your child a deck (or two) of cards and let them try to build a house of cards, seeing how many levels they can stack before the house falls! Experiment with the best ways to get the cards to stay and, if you want to join in, make it a contest of who can build the biggest or tallest house of cards. A few tips: older, well worn cards work best and slightly textured surfaces are better than smooth ones. 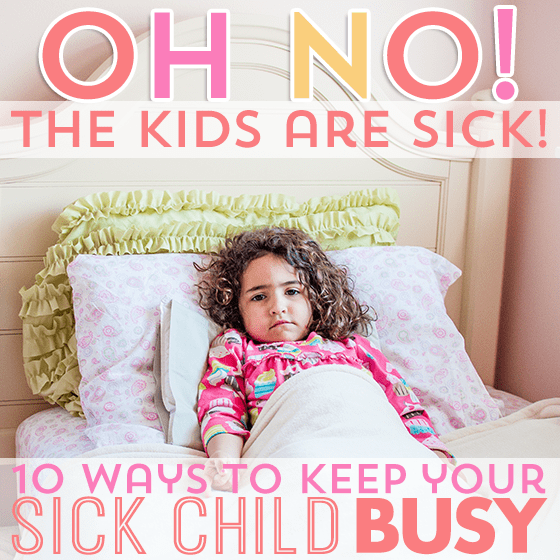 Hopefully your little one is back to healthy in no time! But, in the meantime, now you've got plenty of ways to keep them busy! 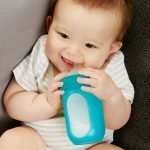 If your child is having trouble keeping any liquids down, be sure to check out 3 Natural Remedies for Pedialyte.